A Virginia politician finds himself in an impossible spot. One day in mid-February, Virginia General Assembly Delegate Robert Marshall was at the Richmond offices of the Family Foundation—a conservative Virginia organization—when he happened to spot a fellow GOP politician in the hallway. 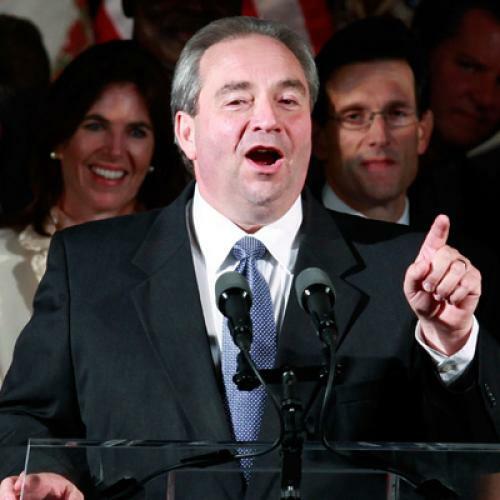 It was Bill Bolling, Virginia’s lieutenant governor and president of the state Senate. At the time, Marshall was pushing a controversial “personhood” amendment, which would have given legal rights to a fetus starting at conception. Eager to secure Bolling’s support, Marshall and his wife hurried after him. But Bolling seemed bent on beating a hasty retreat. While Marshall was still speaking, Bolling stepped into the elevator, smiled, told the couple it had been nice to see them, and allowed the doors to close. “I never heard from him about it,” Marshall told me. It might not have been the most polite way to deal with the situation; but, before you judge Bill Bolling, consider that he may have the worst combination of jobs of any semi-obscure, state-level politician in the country—and hard-right conservatives like Marshall aren’t making things any easier. THE FIRST THING to know about Bolling is that his record is essentially moderate. A paunchy, clean-cut man with severe eyebrows and a light Southern lilt to his voice, Bolling became a state senator in 1995. Though he was reliably pro-life and opposed to gay marriage, Senate colleagues recall that his interests lay elsewhere. He authored a bill (which ultimately stalled) that would have allowed Virginia to distribute almost $500 million in bonds for environmental programs. And he proposed a measure—eventually put into practice by Democratic Governor Mark Warner—that vastly expanded the number of children eligible for a Medicaid-like program. Bolling (who declined my interview request) was elected lieutenant governor in 2005 and again in 2009. Meanwhile, for the ’08 and ’12 elections, he has chaired Mitt Romney’s Virginia campaign. That post is especially important this year, since Virginia is one of a handful of states that could decide the election. The problem is that, even as he is trying to win over the Virginia swing voters who could make or break Romney’s bid for the White House, he also happens to have been the tie-breaking vote in an evenly split state Senate at a moment when Virginia’s GOP legislators were in an aggressive mood—and Bolling, who is running for governor in 2013 against conservative firebrand Ken Cuccinelli, has had no choice but to go along for the ride. “That’s his team, you know,” says Democratic State Senator Dave Marsden, attributing Bolling’s actions to party loyalty. “Since he’s running for governor, I understand it,” says Democratic State Senator Chap Petersen. “He’s gonna have to do what he’s gonna have to do.” In the session that just ended, Bolling was effectively a one-man legislature, casting the deciding vote on 28 measures. He voted to repeal a law limiting handgun purchases to one per person per month. He approved four separate voter ID and election laws, as well as mandatory drug tests for participants in a welfare-work program. And, with a key procedural vote, he paved the way for a mandate that critics said would have required a transvaginal ultrasound before an abortion. Some of these measures—such as the mandatory drug tests—were popular among Virginia voters as a whole. Others, however, were not especially wellreceived outside the GOP base. Two-thirds of Virginia voters opposed the repeal of the one-gun-a-month bill; and 55 percent opposed the mandatory ultrasound bill, while only 36 percent supported it. All of this is probably not good news for Romney. “I think the real question is whether this General Assembly and its positions have helped or hurt Republicans running in November,” says University of Virginia political scientist Larry Sabato. “Romney and the Republicans need moderates.” In some ways, Bolling might have been in a better position if his party had done worse in the last election. “There are things the Democrats in the Senate would have killed ... that [Bolling] had to take positions on, whether he wanted to or not,” Sabato says. Molly Redden is a reporter-researcher at The New Republic. This article appeared in the May 10, 2012 issue of the magazine.